Make sure the pet carrier you're going to use has good ventilation and a secure locking system. 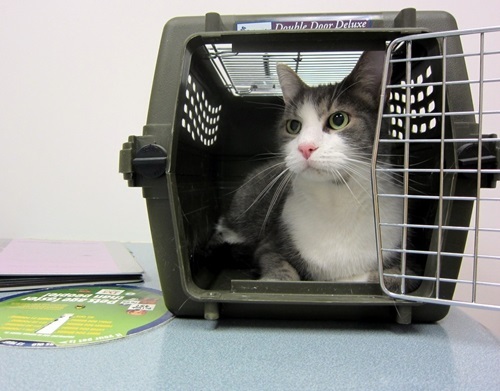 Familiarize your pet with its container at least two weeks prior to traveling. Make sure you've taken a good supply of food, water, and treats. If your pet eats wet food, purchase smaller cans that hold enough for each day so you don't have to think about refrigerating leftovers. Get a water bottle and fill it once you're past security. Hotels and airlines sometimes require proof that your pet is healthy and its vaccinations are up to date, so prepare the necessary pet vaccination certificates and health records in advance. Hotels and airlines also often have regulations and rules about pet transportation and accommodation. Check with your airline and hotel in advance, and make sure you've done everything to comply with them. If the hotel you were planning to stay in isn't pet-friendly, look for another one. Print a list of emergency veterinary services or vets available at the place you're traveling to. Your cat or dog should constantly have a collar with a tag that contains your pet's name and your contact information. Make sure you've taken a leash to keep the pet close by during a walk in surroundings that aren't familiar. Obviously, your pet needs to be trained to being on a leash or harness. Put your pet's favourite blanket, toys, and bedding into the carrier so your companion feels more comfortable. Make sure you've taken calming remedies to help your pet to cope with the stress. Waste bags should help you keep parks, vehicles, and hotel rooms clean. Get directions to pet relief areas in airports where you have layovers. Take a picture of your pet in case it gets lost and you have to let people know what it looks like. Make sure you've taken grooming supplies. Feed the pet a few hours before the travel time, and give the pet a drink of water no less than two hours before traveling. Ensure sufficient supply of prescription medications, if any. First aid kit for animals.